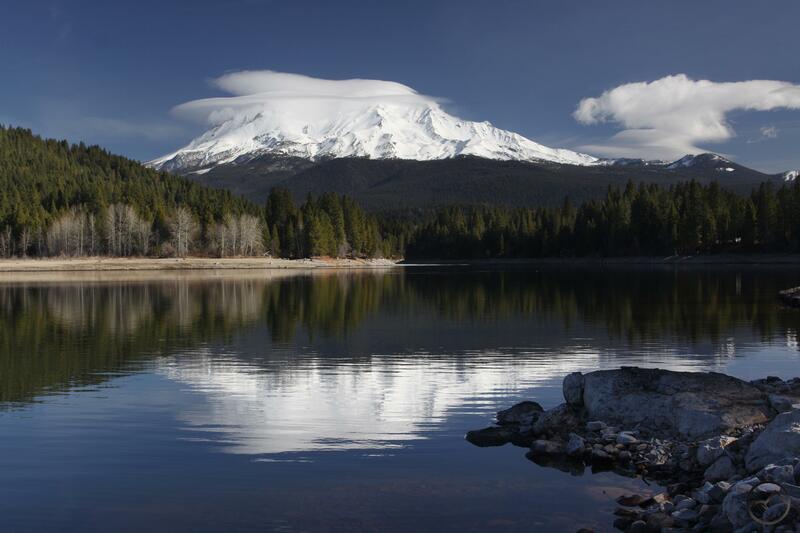 Lake Siskiyou is one of the great recreational assets of the Mount Shasta area. 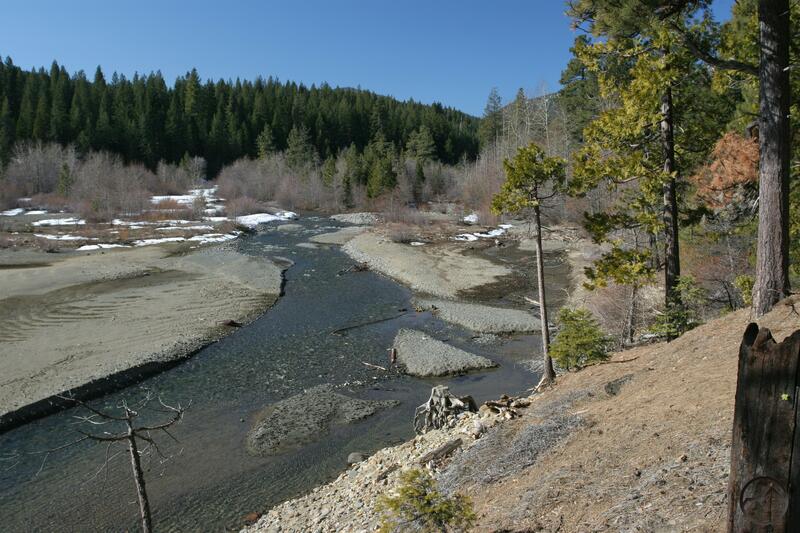 Set in a broad, forested canyon, the lake is formed not only by the Sacramento River but also Wagon Creek and Cold Creek on the north and Castle Lake Creek and Scott Camp Creek to the south. While the lake itself is certainly an attractive body of water, the views from around the shore are what set it apart from other reservoirs. Sights seen from the lake include mighty Mount Eddy and the Eddy Range, Battle Rock (also known as Castle Spire, the highest point in the Castle Crags) and, of course, incomparable Mount Shasta. The view of the great mountain from Lake Siskiyou’s south shore is one of the finest to be had anywhere. In addition to be set in an exceptionally scenic location, the lake also offers exceptional recreational opportunities. Boating, fishing, camping and picnicking, are all offered at the lake. However, it is the trail that circumnavigates the lake that is the real highlight. Although the trail does not travel through particularly wild terrain, it serves up numerous interesting features and a continuous procession of fantastic views. When driving up to higher trailheads is not in order, a hike (or run or bike) on the Lake Siskiyou Trail is tough to beat. Winter at the Sacramento River inlet. In addition to easy hiking, close proximity to town and great views, the Lake Siskiyou Trail has another great feature. The lake’s elevation is relatively low at 3,181 feet above sea level. Consequently, while it may get a fair amount of snow during the winter, the trail remains a viable hiking option for much of the winter. However, one there is one significant change to the trail’s condition during the winter. 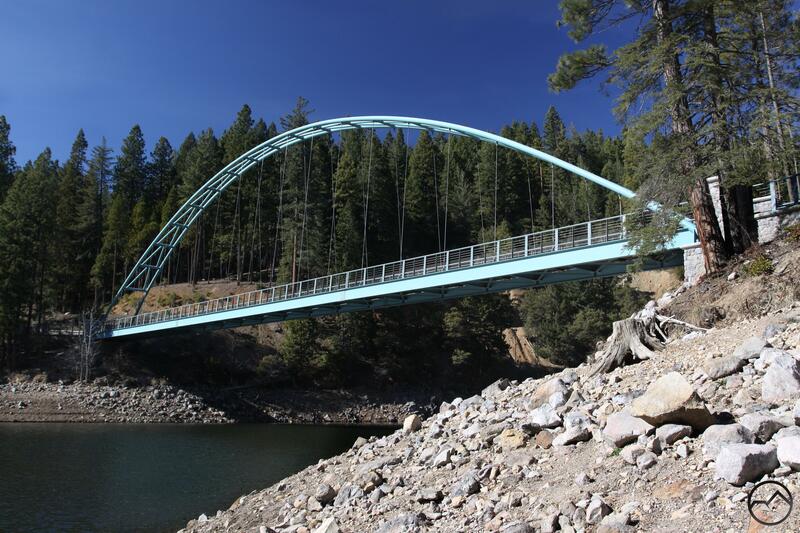 From November through April the pair of bridges that cross over the Sacramento just upstream from the river’s passage into Lake Siskiyou are removed. The bridges were intentionally constructed to be low impact and were thus not engineered to withstand the powerful water that surges down the river during the spring thaw. The pier supports for the bridges are permanent but the ability to remove the spans ensures their survival at high water. Unfortunately, unless hikers are prepared to ford the river (unless the water level is really high, this is a viable option for motivated hikers) it is not possible to complete the circumnavigation of the lake during the winter months when the bridges are removed. 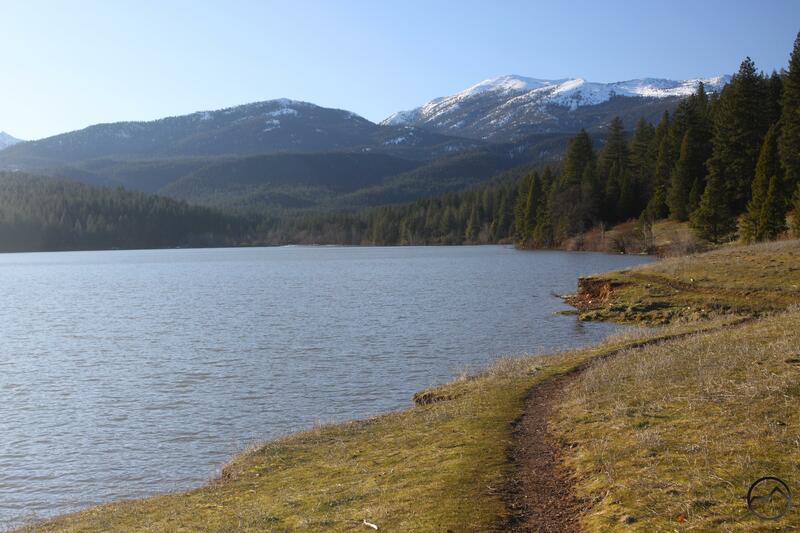 Despite this set back, there are still two great winter hiking options available on the Lake Siskiyou Trail. Even though the loop is not possible, hikers are still able to enjoy treks along the sections of trail that cover the north shore and the south shore. Both trails offer great views of the lake and the surrounding mountains and the chance to hike along the lake and the creeks that feed into it. The two sections also cover most of the Lake Siskiyou Trail’s most interesting sections and cut out the parts that parallel W.A. Barr Road and pass through the Lake Siskiyou Resort. What is left may not be particularly wild but it is still a great option for hiking during the off season in winter and early spring. Mount Shasta highlights the view from the South Shore. 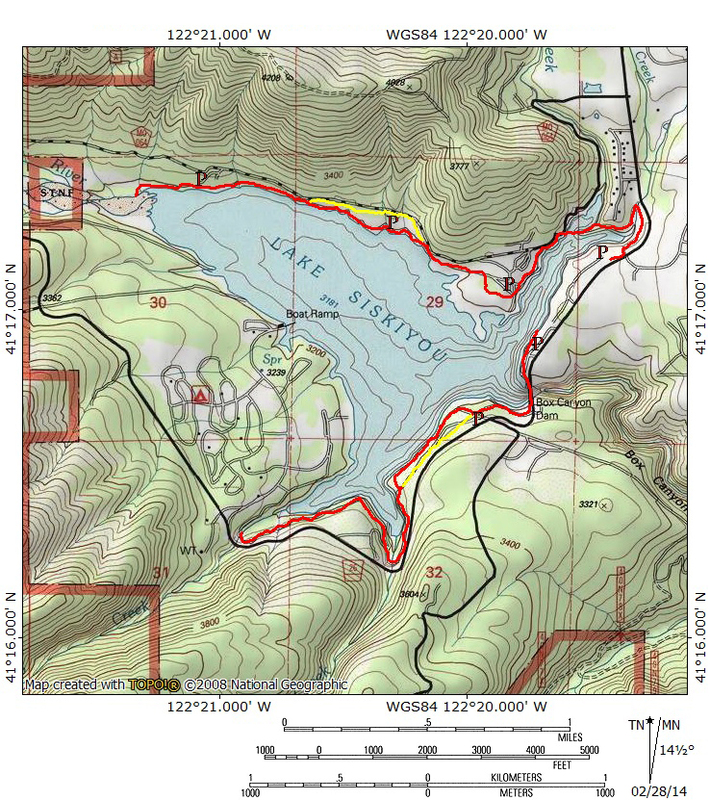 The best place to begin the hike along Lake Siskiyou’s south shore is to park in the large parking lot immediately north of the Box Canyon Dam. From there walk across the dam and pass through a clearing where large metal pipes and other items related to the dam may be strewn. The trail quickly comes to a signed fork in the trail. Staying left will continue on the main trail. Instead, go right on the alternate route and soon arrive at a large picnic area that has one of the finest views of Mount Shasta to be found anywhere. It is an incredible spot. At the west end of the picnic area, look for the alternate route continuing to the west. Here the trail stays very close to the lake (especially if the water level is high) as it passes through some attractive woods. The path eventually proceeds through some thick manzanita before it turns to the left and rejoins the main trail, which is basically a service road. This road winds its way around the pair of canyons containing Castle Lake Creek and Scott Camp Creek. Both creeks pass beneath South Shore Road via large culverts. The water pours out of each pipe into attractive pools before the creek continues onward toward the lake. Either creek makes a good destination for a day hike, though the area around the water can be heavily overgrown. On the far side of Castle Lake Creek the remnants of an old road lead down to where the creek meets the lake. Scott Camp Creek is the larger and more attractive of the two and some areas along the water are clear and easy to get to, making it the better of the two destinations. The Wagon Creek Bridge on the North Shore section. To begin a hike on Lake Siskiyou’s north shore, park at the lot located across from the entrance into the Mount Shasta resort. The trail initially stays very close to the road but, fortunately, is shielded by a thick hedge of trees. The sound of rushing water is soon audible. This marks the beginning of the descent into spring-fed Cold Creek’s narrow canyon. After crossing the culvert through which the creek passes under the road, the trail follows close by noisy Cold Creek. The water begins to fall well below the trail, which is now slung on the side of a cliff. The trail then emerges onto a narrow spit of land where the lake is present on both sides. At the end of the spit is the Wagon Creek Bridge, an impressive engineering feature. On the far side of the bridge the trail traverses a steep cliff before arriving at another parking lot. Beyond the parking lot, a large meadow flanks the trail. Some trees were recently cut down to allow for meadow restoration. The area looks a bit distressing now but the stumps are being ground out and native grasses replanted. After passing by the meadow the trail comes back into contact with the lake. Here hikers can stay on the main route or descend a short distance to follow the alternate route through large grassy sections with good views of the lake and Battle Rock. Passing through another large parking area that permits cars to drive down to the water’s edge, the main and alternate routes maintain a parallel course until meeting up again along the lake’s north shore. The path continues through the woods, staying close to the lake for a ways. Finally it makes a short drop down to the Sacramento River’s level. Here hikers can explore the river area or continue upstream on some unofficial use trails. Both are great options.